The OSG and VOs meetings are hosted by LIGO (Laser Interferometer Gravitational Wave Observatory) in its laboratory in Livingstone, LA. It is isolated, far from any town, in the middle of swamp and forest because its mirrors are very sensitive to vibrations. In the facility there is a 10mph speed limit to avoid interfering with the experiment: it is like when you have to move quietly not to disturb a sleeping baby. In the picture there is the "waving wall" on the outside of the building. Today, Tuesday, ATLAS and CMS had their VO meetings. day discussing on what may be an ATLAS Tier3, what it will need in term of resources and support and how can be technically done, in this afternoon coffee break we were split in 2: one group touring the site, one playing in an interactive science exhibit. 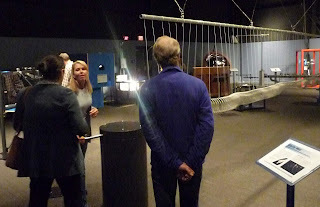 Here some scientists in front of a giant slinky.